Most likely this review of Sony TJ37 will be the last one from reviews on our site dedicated to PDAs by Japan's giant Sony. The company has announced it leaves the PDA market in the US and Europe, in fact this means the end of commercial production of handhelds. The rest operations if any will run only in Japan and involve prototypes. So we won't see a wide and frequently updated model line as we used to. We won't discuss the reasons for this step and just will tell you about one of the latest handheld computers by Sony. Sony TJ37 belongs to a mid price range. It stands out mainly for an integrated Wi-Fi module and a digital VGA-camera. The junior model Sony TJ27 lacks Wi-Fi and the support for MP3 (there is no a headphones jack), but still it has a camera. The models differ slightly in shell colors: Pewter Silver for TJ27 and Platinum Silver for TJ37. Both handhelds completely replace such models as Sony TJ25/TJ35. That is almost the same casing and the same price ($200/$300) for extended opportunities with Wi-Fi and the camera. The design was inherited from the predecessors of the TJ-series - strict lines and silver plastic. There have disappeared rounded edges from the top and the bottom - the shell form looks stricter. Well, everything is made in the Sony tradition. The silver plastic is pleasant to touch, and the device feels good in hand. I'd note that the coating might peel off at edges, even if you treat the handheld gently - it was annoying to learn that. The handheld has a common size for its class: 113x75x13.2 mm, which is a little bit larger against the TJ25/35 (110.1x75.3x11.9mm), however you'll hardly notice the difference. The weight remained the same - about 140 g. One can call it neither light, nor heavy. The front side has nothing of a surprise. Traditionally there is a Graffiti zone below the square screen. Lower you can find double buttons that are gaunt. In the middle there are Left, Right buttons and the scrolling wheel with Enter function. This wheel is not very comfortable when you read books - you have to either arch your left or right thumb when the handheld lies in your palm, or hold it at the bottom, in this case the center of the handheld will be shifted from the palm, and the top part will lean over. The model isn't comfortable to play arcade games, however there are not that many games for Palm OS. The LED for Wi-Fi is located at the left bottom, and the LED for the charger rests at the top. The screen cover is attached to the right side, but not securely enough. If you wish you can unscrew the accumulator compartment to make sure the battery couldn't be replaced on your own. The top side looks quite common. An IrDA gap carries a strange inscription WLAN and a Wi-Fi icon (however IrDA also belongs to wireless technologies). The standard 3.5 mm headphones jack is positioned in the middle (as for the MP3 playback quality, it's very high like in the recent handhelds from Sony). Here you can find an expansion connecter for Memory Stick/Memory Stick Pro cards. Nearby there is a card access lamp (do not eject the card when the lamp is active). At last there comes the silo. As for the stylus, it's a telescopic one made of metal, typical for Sony handhelds. The power slider is located at the right side. Using it you can switch off the backlight, hold buttons, turn the power off. We'll discuss camera control buttons in the corresponding chapter. The back panel hides soft reset. The bottom side has the connector to plug a synchronization cable and other peripheral devices. Like in previous models of the series theTJ27/37 is powered by Motorola i.MXL 200 MHz processor. The productivity tests revealed the same results as for the TJ2/35. In the real conditions the handheld performs well, nothing slows down, including the video playback. The TJ27/37 carries 32 MB of RAM onboard, 23 MB of which is available to the user. It's a common memory size for Palm OS driven PDA, which is enough for many applications. You'd better use memory cards to store files and install games. The handheld comes with a non-removable Li-Ion battery. 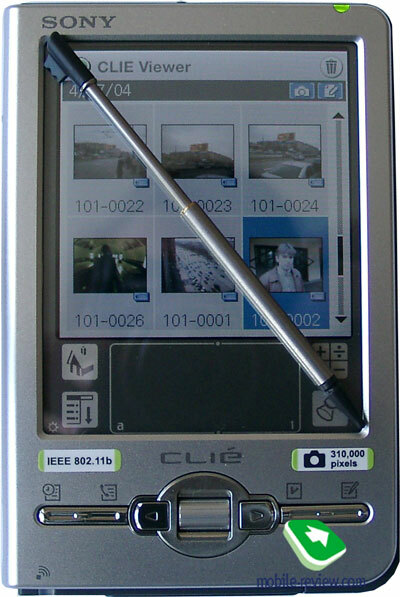 The manufacturer claims the following figures for the battery life: continuous work with Wi-Fi at the maximum backlight - 2 hours; the music playback, Hold mode on - 6 hours 30 minutes; organizer mode 30 minutes per day with the mid backlight - 5.5 days; organizer mode 30 minutes per day with the backlight off - 10 days. The tests proved that the battery life claimed doesn't differ much from the real performance. These are quite satisfactory results, but they too far from those for Sony TH55 (the model enjoys almost the longest battery life). The TJ27/37 is equipped with a 320x320 pixel, 65K color TFT screen. It's an average screen for low-end handhelds by Sony with its color rendering, brightness, color saturation, however it is worse than that for more expensive models with 320x480 pixel screens. There are 4 backlight levels, being not too bright the minimum level is enough for work in the dark. In all, everything here is standard, nothing special to draw attention. In addition to the standard connector to plug the peripheral devices (for example, a dock-station or a keyboard), IrDA and MS slot there is a built-in wireless module Wi-Fi (only for the TJ37). This is the first (and the last?) low-end solution based on Palm OS with an integrated Wi-Fi module. During tests the handheld communicated with the access point, received signals through concrete walls involving WEP 128 bit encoding. From time to time the TJ37 had been losing the signal, so another connection was needed. As for the weak points, it's impossible to determine the signal level (weak, strong) during the active connection. The camera is located at the back panel firmly fixed. It is dipped and protected with a shutter, so don't worry about scratching the lens. The camera control elements are located nearby - the shutter button at the right side, the shutter slider at the bottom side. When the shutter is open, the camera application gets launched, and the screen is rotated at 90 degrees and serves as a viewfinder. You can manually set the following things: the location of photos (on a MS card or in RAM), picture resolution, shutter sound and sound volume (you cannot turn the sound off), brightness (5 levels), white balance (3 modes and one automatic) and two effects (Sepia and black&white). Unfortunately, TJ37 doesn't record video clips. It seems artificial, as there are no technical limitations to record video. Sony TJ27/37 is powered by Palm OS 5.2.1. In addition to the input system Graffiti 2 there is the taught text input program Decuma 3.0. Without training the system supports the following languages: English, French, German, Italian, Spanish and Swedish. The percentage of correct recognition for English is high, but we've failed to apply the system to Russian. The software package does not include anything new - a standard set of Sony applications, like that for Sony TJ35. The table below shows applications for the both handhelds (click to increase the size). Sony TJ37 represents a good mid range handheld by Sony. It has almost no rivals taking into account the price/functionality ratio (camera, Wi-Fi). Don't try to compare TJ37 and Palm Zire 72, like many do. 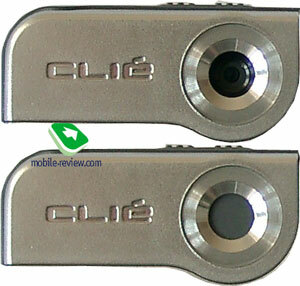 These are quite different models - Zire 72 features another wireless adapter Bluetooth and a camera of another class. TJ27 lacks the support of MP3, that is the main shortcoming. 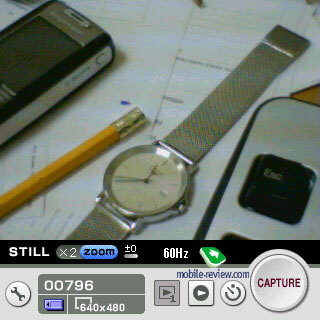 However it's one of the cheapest handhelds with the built-in camera. The prices in the USA are $200 and $300 correspondingly. Note: audio out (MP3 playback) and an integrated Wi-Fi module - only for Sony TJ37. We are grateful to Sonystore.ru for the provided device.